"Farewell, Aleppo: My Father, My People, And Their Long Journey Home"
Sheilah speaks with Claudette E. Sutton about her new book. These days the name “Syria” is more often than not preceded by adjectives like “war-torn” and “devastated.” It evokes images of belligerent militias, Islamic extremists, and unending civil war. It’s hard now to view this land between Iraq and the Mediterranean Sea as ever having been peaceful, culturally rich and home to tens of thousands of Jews whose families had lived there for centuries. That’s the Syria, especially its northern city of Aleppo, that grounds Claudette Sutton’s story of the odyssey her father and several of his brothers traveled from the Middle East to the U.S. 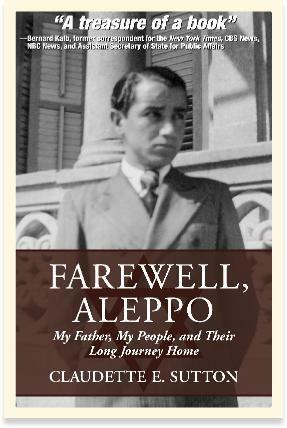 The book is called, Farewell, Aleppo: My Father, My People, and Their Long Journey Home. Claudette Sutton grew up in Maryland, and her father Mike lives in Maryland still. They both join Sheilah in the studio.